Toyota Nation Forum : Toyota Car and Truck Forums > Toyota Truck, SUV and Van Forums > Hilux (Pickup) Forum > 89-95 Toyota Pickup/Hilux > 89 V6 No Start. Hello, trying to get an 89 V6 4x4 started. It will turn over it seems but will not start. Before it quit it would run very rough at times & became progressively harder to start. Then it finally will not start. First thought is the pump finally died. So how do I check the fuel pump on these? Exactly where do I spray the starting fluid? Also any other little tricks I should know? I am a Jeep guy. I do love toyota's but never had my own to work on. This is my paw paw's truck. Figure it couldn't hurt to come here & ask experts. I learned so much about Jeeps over at cherokeeforum. Any questions I can answer to help you, help me, I will. THANK YOU. How many miles on yer vehicle? Any issues prior to this issue? Any maintenance performed prior to this issue? I take it that yer engine is fuel injected? If it's fuel injected, have you been running the fuel tank low? Have you inspected the fuel tank fer any rust issues? Do any of yer grounds have any rust issues? To isolate whether or not it's a fuel delivery issue or not, you'll need to spray some starter fluid into the intake system. I usually pull the brake booster hose off of the air plenum/intake manifold and spray about 3 seconds worth. Put the hose back on and crank it. If it fires and sputters out, then it's a fuel delivery issue. It could be the fuel pump or fuel filter. The usual test is to check the fuel pressure but yer gonna need a special adapter to tap into the fuel line/rail since Toyota didn't install any test ports on the fuel rail. There's another test using a jumper to manually send power to the fuel pump so you can hear or feel the tank fer vibration. Have you checked the EFI fuse to make sure it's still good? Last edited by BamZipPow; 04-12-2019 at 12:27 PM. So just to be extra sure. 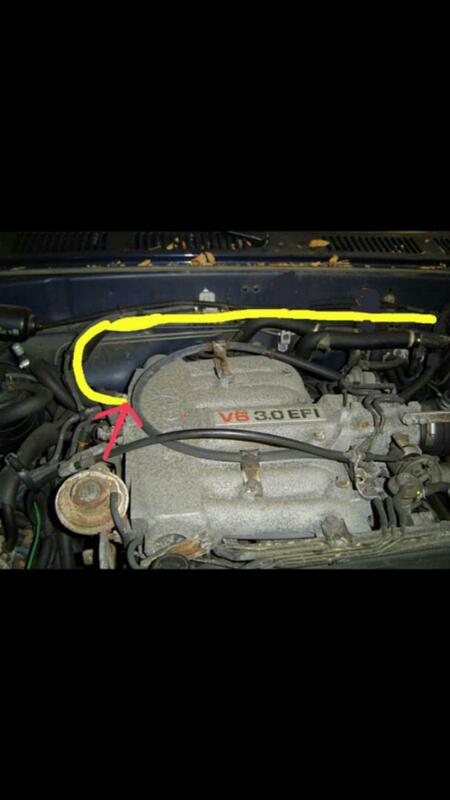 I need to pull the yellow hose at the intake & spray the starting fluid into the intake? Thank you, again. Since this ain't my truck I'm being extra careful. I know somebody one time who sprayed a lot of starting fluid into the wrong place & tried to crank a truck. It backfired so hard it broke the timing chain cover.....and no it really wasn't me HAHA. Yes, that would be a good spot. Ok. I sprayed starter fluid 3 times into that spot on the intake. I reckon I sprayed it fine....HAHA. The truck just does the same thing. Turns over & over. Didn't even sputter like ut wanted to start. So now I'm thinking it is not getting spark which points to distributor cap, ignition coil, etc. My paw paw just told me that it hasn't had a distributor cap put on in 19 years! Any other advice & ways to trouble shoot appreciated. Would a worn out distributor, ignition coil cause one to run rough before it completely quit? I know a lot of this stuff is pretty common knowledge, but once again, sinece this ain't ny truck I am going very slow & asking even the most basic of questions. If it was a Jeep I'd be much more comfortable. Last edited by Chick-N-Picker; 04-15-2019 at 07:19 PM. Now that we've isolated it to an ignition issue, we can start trying to figure out what's not working. Pull the distributor cap off and take a piccie of it and the rotor. I'm curious on the condition of either one. Since the vehicle hasn't had the cap and rotor replaced in the past 19 years, what condition are the spark plug wires? Same goes fer the spark plugs. It's probably worth yer time to just do a standard tune up and git all those unknowns out of the way. It's just probably something simple as a tune up. You could probably git a spark tester from the parts store or Harbor Freight. They are usually under $10. It will give you a good indication on whether or not you have a good spark or not. You want to see a nice blue spark and not some orangish spark.